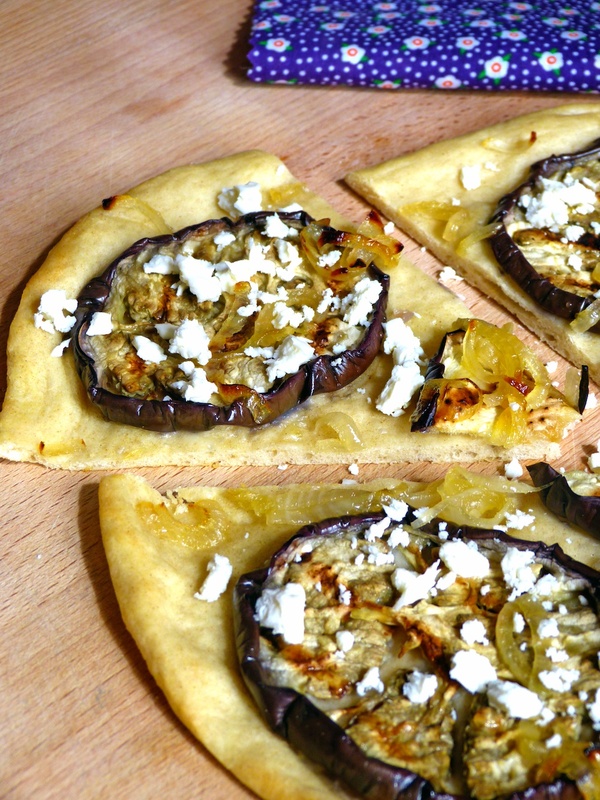 Ammazza che pizza and their “romana” deep-fried culture have landed in Berlin! Whether they are dealing with entrances, pizza or first courses, their keywords are always simplicity and best quality. Rounded, light and crunchy, but with a thick and soft crust: this is how we could describe Ammazza che pizza pizzas, the brand new Italian place in Maybachufer 21, right into the heart of Berlin’s block Kreuzberg. Even if their name seems pizza orientated, this not only pizza place offers you delicious Italian entrances, first and second courses and desserts. “what really matters to us is that everything must be strictly homemade” points out Davide, the owner, who first started his gastronomic trip from his family kitchen, where he used to cook with his mother Teresa. Driven around the world by his curiosity and passion, Davide built himself as a food and beverage manager right before becoming the Ammazza che pizza owner, along with his mother, in Berlin. Born and raised in Rome, Davide moved his very first steps in the gastronomic world working as a waiter during the weekends and helping his mother in their home kitchen. “I was 26 when I decided to focus on my English knowledge, starting a trip which would have kept me away from Italy for a very long time” claims Davide, who came back to Italy after more than 20 years with his wife and two kids, and a brand new project in his mind. He successfully completed a pizzaiolo course at the API (Italian pizzaioli association) in Rome, 2016, right before moving to Berlin and opening his own restaurant. Napoletana or romana? This is the question! 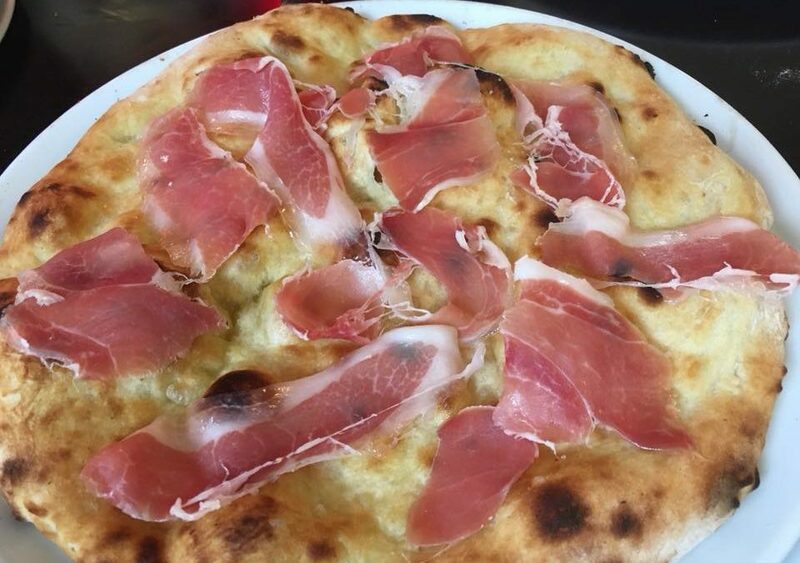 Even if it stands for the excellence of the Italian cuisine, it is not easy to provide a single definition for pizza, though to Davide this is the real deal. Born from a Neapolitan mother but raised in Rome, Davide has always found himself stuck between those two monsters of the real Italian traditional pizza. There it is where his pizza concept was born: rounded, with a very light and crunchy dough, surrounded by a slightly thick crust, which could be defined as the perfect compromise between the two Italian pizza “belief”. The leavening makes the real difference: the dough is let rise from a minimum of 48h to a maximum of 96h. Regarding the ingredients, Davide has opted for a mixture: the Ammazza che pizza flour is the same used by the API, while mozzarella and tomato sauce are provided by a supplier based in the Italian region of Campania. Cheese and cold cuts boards, traditional roman deep-fries, homemade pasta, and delicious dessert. 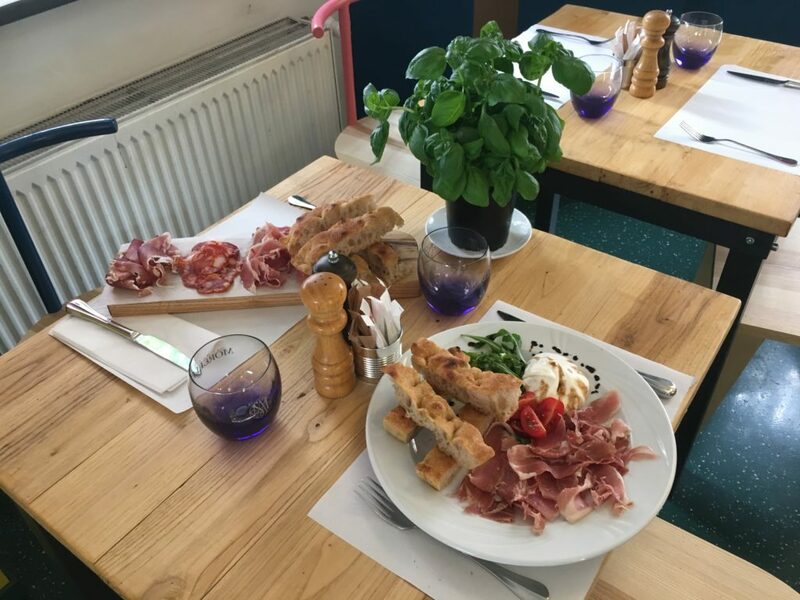 Along with the pizzeria, the Ammazza che pizza kitchen has a significant role, especially for the presence of Maurizio, the young and talented Italian cook, who works by Davide’s side. “When we first met, he entered the kitchen, and after taking the spoon from my hand, he started telling me all his experiences. I hired him straight away!” that is how Davide playfully recalls the first meeting with his cook, who brought him a smocking fig crostata during our interview, as a present for Davide’s wife. “Here at Ammazza che pizza we are extremely passionate, and we love taking care of your palate, giving you always the best food experiences. That is why we taste all the products first” claim Davide. Thanks to the huge open-air Turkish market, which takes place every Tuesday and Friday on the channel side right in front of the restaurant, it is easier offering fresh and seasonal products. The mentioned market is one of the reasons that pushed Davide and his wife to choosing Maybachufer as the base for their new business. “We buy there all the fruits and vegetables, while we get the rest of the products from one of our trusted Italian suppliers” explains Davide. 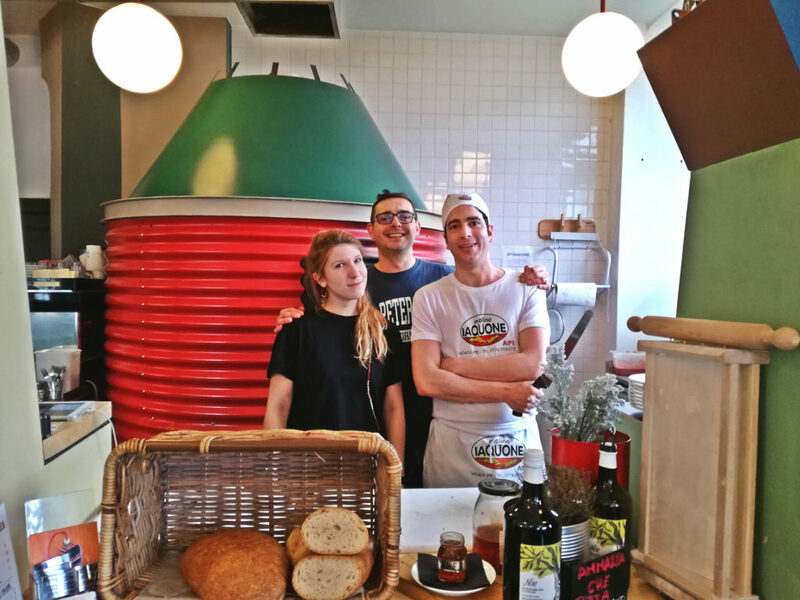 Cold cuts and cheese boards are conceived by a small butcher from Sturi del Viterbese, friend and supplier, underlining how much important passion, simplicity and familiarity are to the Ammazza che pizza team.